that most commonly comes to mind is the multi-level building of private residences. This is the kind of condo that I will be focusing on this page, although there are others that I will mention below. Think of a “condo” as an apartment that you own. As a matter of fact, I would like to point out that it is exactly how it is called in NYC no matter if you own it and even though it can be one of those $25 million-seven-marvels-of-the-world “apartment”. And even if you were to put up that kind of money, your “exclusive” ownership extends inward to your interior walls, floors and ceilings. In addition to that, you are a “partner,” or, in another way to think about it, a “co-owner” with all of the other owners in the complex, of all the necessary structure of the building like the foundation, exterior walls and roof; as well as any common areas and amenities such as swimming pools, clubhouses, tennis courts, play areas, among others that might come to mind. These are often referred as “common elements,” or “common interests” which means these areas and facilities belong in “common” to all condominium owners and at the same time. Through the years there has been the development of a body of laws, collectively know as the <em>horizontal property acts </em>allows the ownership of a specified layer of airspace also know as condominium. On my page “Bundle of Rights” I have gone into some length on how a “real property” ownership carries many more rights than any other kind of properties that you might posses. Theoretically a real estate property is NOT only the house and surface your eyes can see - but it goes deep into the center of the Earth and, in the opposite direction, up in the air into infinity. Well, I went on to expand "Air Rights” to a page by itself because I knew it was going to be front and center when it came to condominium ownership. In a condominium the other rights are still there, however they have been sliced off and you own exclusively a “slice of the air” inwards to your unit. Outside that “cube in the sky” you own the “rights of enjoyment” of the common areas, however those elements of the condominium are “owned concurrently” with all the other owners who have as much right as you do. Condominium HOAs are the ones that need to have a more elaborate system in place so it can function properly. Due to the large number of dwellings “under one roof,” it makes it a real challenge to keep that big entity running smoothly while fulfilling all promises and obligations. It is literally a big ship that needs a captain’s steady hand to navigate in waters that, at times, can be troubled. MASTER DEED - A master deed to the land will be produced and it will include a complete legal description of the entire property, as it should be done for other kind of use of the land. DECLARATION - The declaration will include a complete description of each unit and of the common interest attached to each unit. It also will contain a description of common areas and limited common areas such as parking and storage areas. PLAT - A plat of the land along with plans and specifications for the building soon to be constructed. BY-LAWS - By-laws will establish the framework of what will come to be the owners’ association that, in time, will have the responsibility to run the community organically. Covenants, Rules and Regulations – is another set of governance rules that providing more specific details of restrictions and conduct will be established by the Board and offers the advantage that they are more readily amendable than the ”Declaration” or “Bylaws.” would. Depending on the applicable law in the state you live in, a sets of these rules and regulations are made available to residents – and potential buyers - through public files or as a matter of public record via a condo or homeowners association website . Your real estate agent would be able to attain a copy for you. Every bit as much as I wrote about the power of a subdivision to impose restriction of the use of the property, it also will apply to the uses of a condominium. As long as no discrimination exist – they can start with the general laws the declaration can make it stricter the by-laws can be made stricter still. This is nothing more than an apartment complex the owners come to a conclusion to terminate the renting situation and convert into condominium. Thus the term condo-conversion don’t let that confusion you. Generally they will renovate and update the units in a process that might shut down the renting relations all at once or they may opt to let leases expire with notices of non-renewal. Many owners will do a complete renovation but many will try “just paint an’ puff” - please be on the look out when faced with a “conversion” because even that in the surface “looks nice,” you are still purchasing a building that is decades old. I think that one of the coolest things about living in a condominium setting is that it is the lowest maintenance for you to do personally. HOA should take care of all repairs outside your front door. Some will even do some repair inside if is caused by the elements or from other owners such is the case of water infiltration. That rain caused some of the storage areas to be flooded and consequently there was some mold growth down there. Storage is a “common area” so HOA was the job. First to drain the water and later when mold started to grow they had someone to cure it, including removing the infested drywall and replacing it. Around here they also do seasonal maintenance on the air conditioners and heating. General plumbing is also included. Not so bad, hum? Landscaping and tree removal is always included, unless you want to have a hands-on approach to gardening and volunteer to that committee. Condominium CCRs can - and will - tighten the grip on how the owner’s will precede living on that environment as compared to a subdivision or even compared to a town home. As much as other planed urban development, it also starts with the builder that must register and administer it until 75% of the units are sold. A board of directors will be elected and the board will select the officers. The board usually presides for a period of one year. I would like to bring up a strong word of caution that when a homeowner falls behind in the HOA dues, fines and other restrictive measures can be imposed – like lose of parking and/or use of recreation areas. And if the amount owed goes over a certain limit [in Georgia is $2,000) HOA can force that unit to go to foreclosure in order to recover the money. Please do no let the marshal knock on you’re your front door foreclosure papers on hand because your HOA dues are in areas! Another thing to be aware of when living in a condominium setting is the political reality of an owners' association. It also pays to be involved on the decisions that may be made in the HOA meetings, they may cost all individual owners more money, but not necessarily deliver equal benefits for all. It can be nearly impossible to avoid being affected by at least one condo board decision, so your active participation in the meetings and discussions may be something that you should schedule on your routine so you can also give you input in the community decision and events. One active participation is part of your ownership enjoyment. It is not that I like paying HOA dues more than anybody else, however I have some reasonable explanations for the fees paid to a well-oiled and well run association. On average I would budget no less than 2 to 4% of the value of the property every year to keep it humming. The last house that I owned would take a good $4,000 to maintain it. I felt that more needed to be done. And thank God I never had the expense of replacing the roof. The swimming pool was almost overwhelming to keep up with, not exactly the kind of fun it cracked out to be. The second point is that the higher the HOA fees, the higher your expectations should be on the level of services and amenities and, consequently, maintaining the value of your property. Parking – How many? Unassigned? Assigned? Deeded? The arrangements vary immensely and it has to be understood right off the bat. You need to know how many parking spot(s) your unit will be allowed. A good rule of thumb is 1 car per bedroom, however there is nothing set on stone – in doubt ask! The first scenario would give you a certain number of “unsigned” spots. Anybody can park at any place at any time - “free for all” approach. Next step up would present you with “assigned” spot(s) – those are a bit better. Those spots are reserved exclusively for your unit to use. The “possession” and “enjoyment” are assigned to you but the parking spots are part of the “common areas” belonging to the association. The next step is still the best of the three – you would have “deeded” spot(s). That (or those) spot[s] are pieces of real estate that you own. They may be counted as such along your other premises. There can be a situation where the HOA owns the parking spots/garage and charges an additional monthly or annually parking fee above and beyond the other mandatory fees associated with the unit. Some buildings will have “valet parking” - Oh, you got to love those! Others will have no parking whatsoever – I have seen them all: please do not assume you will have it, always ask. In many places where the condo is located in a busy street or if the off street parking is “competitive,” parking spots are coveted slices of real estate. In any case it still leaves the open question where your guests will park. Parking is a subject that very often generates conflict among property owners. This is one of those things that I mention on my home page that can bring stress and frustration to your home buying. So please ask all these questions ahead of your final decision to buy the place… and the “exhaling” of home buying will be even more enjoyable! Condominium living can be very restrictive to your pet – some can even go so far to ban pets altogether. There are restrictions on what kind of pets may be allowed and what size. I have seen some regulation on what weight a dog can have – and if the pet exceeds the limit, it has to go on a diet. So, I think that you would know my thinking by now: It never hurts to ask! You want to be proactive about this part of your family as well and get to know how these little being that bring so much joy to our lives will be received in you new neck of the woods. What happens to the bundle of rights? As we can see on my bundle of rights page, a real estate property offers you numerous rights and they can be used separated by the land as well as the can be used concurrently by different parties. Condominium buildings make particular use of these characteristics: First of all the air rights are used to create horizontal properties and by stacking them up creating a high density use in the same foot print. Each condo owner has complete control of his/her unit including the right to freely dispose of it – read: sell it. Second: create a “vast concurrent use” of the common areas, so everybody can “enjoy” and have possession of it, but cannot sell the common area separately. As for mineral and water rights I wrote about – in a condominium setting, they do not go away: if oil, gold, gas or marketable water were to be discovered each owner would be entitled to a fraction, proportional to either the number of units or the area of the condo. The possibility of finding oil under your condo is remote, but your rights, as a condo owner, are still there! I work with many investors who want to buy condos and keep them as income properties via renting them. In general, condominium owners can rent their units to tenants, similar to renting out other real estate properties. It can be in a permanent basis or for a certain time of the year. Because not all tenants are created equal, a complex with too many unruly tenants can adversely affect the overall value of the units. Another factor in play is if the complex meets FHA regulations where that government run entity will back financing on the units, which means lower down payment, which in turn translates in a bigger pool of suitable buyers. That kind of awareness has caused an increasing number of condo buildings to limit the percentage of units that can be rented out at one time. Some will not allow renting at all. I have encountered countless complexes where there is a “waiting list” for the owners to get their turn to rent... The waiting time can be years. You will be responsible for payment of Condominium Association fees. But then again it cover lots of expenses that you would normally incur living in a detached home. Privacy - You give up more privacy when compared to single family homes as well as townhouses. You only own from your interior walls inward. The rest of the structure and all of the land is owned in common with the other condominium owners. When it is time to sell, it can often take longer to sell a condominium. Noise – can be appreciatively more coming from your neighbors... Conversely you need to be aware that you might generate more noise to them. No yard upkeep, Exterior maintenance, Pool cleaning, Tree removal - You will be responsible for little or no exterior maintenance or repairs. Many condominium communities offer amenities (pools, play areas, tennis courts, etc.) you may otherwise not be able to afford on a single-family scenario and/or – what for me is the biggest selling point: it takes a lot of your time to maintain. The complexes are often located in locations convenient to centers of employment, entertainment and shopping. Condos are often more reasonably priced than other forms of housing in the same area. There are occasions on the life of a building that it will need an overhaul. It can be the roof, external wall painting or any other major undertaking not covered under routine maintenance and budgeting. It is very important that you understand that this is a new few outside the normal monthly dues. In most cases it is significant in value and/or they can be in place for a long time. I once was interested in a very nice town home [which, for this matter works pretty much as a condo], exactly at the time they decided to <em>change the roof, siding, gutters and the fence in front of the entire complex.</em> It was voted in and the board took a $1,500,000 loan to be repaid in 15 years. The monthly dues instantly jumped another $120/month thanks to difference in the assessment: $120 X 15 years amounts to really money on my math. equal to the annual rate of inflation as measured by the Consumer Price Index for All Urban Consumers for the immediately preceding 12 month period may be disapproved by unit owners holding a majority of the association vote. I know that I repeat myself sometimes – but if it will save you a bundle, please allow me to do so: It pays to be aware and ask about what is the law in your neck of the woods. I am following here the most known form of “condominium building”, which is the “build up” variety. And in similar form it can be traced back to the times before Christ. In high-density areas, for the times standards mind you, the idea of “build up” was already popular. In the first century AD Rome, Nero sought to impose some regulation - one of which was to allow for more space between the buildings, after the infamous big fire that almost destroyed the Eternal city. It is almost ironic, but not all historians support the common belief that Nero was the arson-in-chief he is portrayed to be. 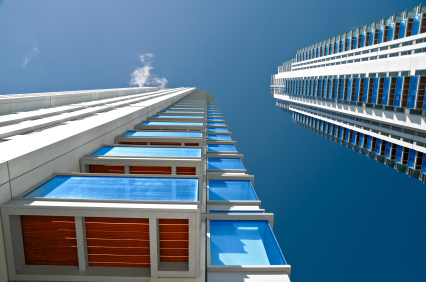 However, contrary to what most came to believe, the word 'condominium' does not apply to the type of structure itself, but the legal ownership arrangement. The origin of the word comes from Latin and it is actually comprised of two words: “con” meaning “together” and “domain” meaning possession. Through history, in international law, the tern has been applied to territories that were under joint sovereignty of multiple states. It also could mean this kind of territory itself. Up to this day there are still small pockets of territories with such arrangement: the one that always comes to my mind is the Iguacu Falls is South America – said to be the longest fall on Earth. It is one of the marvels of the world. It is almost impossible to separate it, so it is a condominium concurrently belonging to Argentina, Paraguay and Brazil. In the “real world,” if you come to observe a bit closer, there are other “physical forms” of “condos:” even subdivisions are condominiums – more so those gated communities. Town Homes, given their hybrid nature, have a very strong “feel” of condos. ...And it makes for very quiet neighbors, indeed!